Ed Begley (1901-1970). Begley was an actor who starred in Sweet Bird of Youth, Boomerang and Sorry, Wrong Number. Ed Begley. ALS. 1pp. 7 1/4" x 10 1/2". Merrick, L.I. April 11 1947. 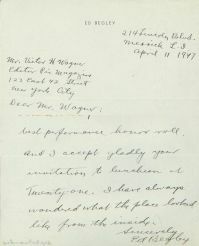 An autograph letter signed by Ed Begley on his personal letterhead. Begley wrote to PIC magazine editor Vic Wagner: "I am happily surprised and very proud that I have been placed on PIC's best performance honor roll. And I accept gladly your invitation to luncheon at Twenty-one. I have always wondered what the place looked like from the inside." The letter is in perfect condition.